Acting CPL 13207 MGC, 21289 DLI. George fought at Loos, the Somme and Passchendaele but know none of the detail other than he was involved at Le Trone (?) Wood. Wounded twice. 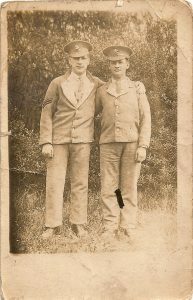 (see pic of him on left, taken at a Military Hospital after Battle of Loos 1915. Note DLI cap badges). b 1895. 1911C a hammer heater in Sheffield. Son of Mary Standrin, (b 1874 Hathersage see pic c 1920s), who was tragically killed while re-wallpapering their home in 1930. She was stripping the old paper and placing the pieces in the large front pocket of her apron, when she leaned over the coal range. She died of burns in Sheffield Infirmary. 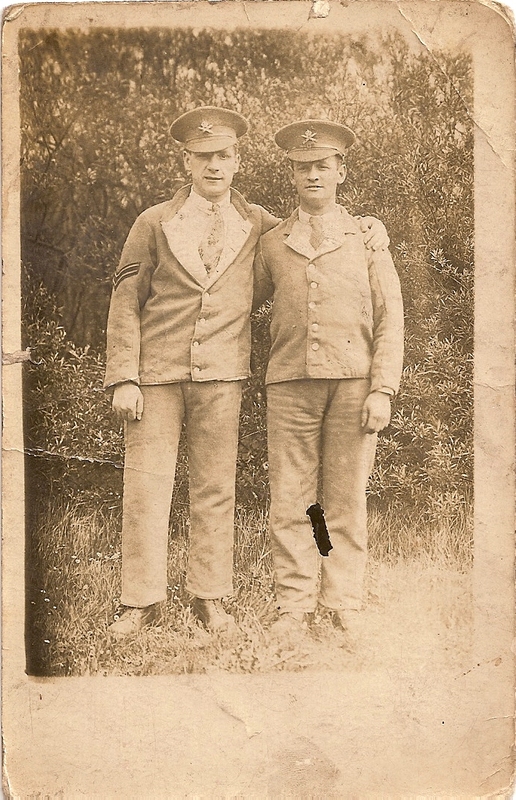 George’s brother was Alfred above and his cousins were Fred Standrin, and John Willie Standrin, above. George Frederick married Florence Wright b Sheffield 1896, Their elder son George, b Sheffield 1920, served with Bomber Command in WW2. Previous Previous post: WESTWOOD, Alfred. M.M.